Another busy week in the bag. My Niece Meegan turned 19 last week and as part of her birthday she was given two tickets to a Paint Nite here in Saskatoon. She said the first person she thought of was me, so she invited me as her date and we spent a really fun evening painting together with a bunch of other ladies... check it out! It was really interesting to see so many people painting at once - with all skill levels. Because there's not a lot of space in my house for a magenta daisy, i gifted my painting to Meegan to put up at her place, so they match. Also, a fun thing to note is that Meegan and I have matching paintbrush tattoos and her paintbrush has teal paint on it, and mine has magenta paint on it. aww. This week i crossed of a (relatively new) item from my Bucket List - and i saw the Broadway Musical The Book of Mormon. It was amahhhhzing. so funny. I haven't laughed so hard at a show in a very long time. And everything about it was wonderful. Such Satire. But i'm also a very big fan of South Park and Trey Parker and Matt Stone. They are brilliant satirist, in my opinion. So we wandered the river and the parks and took advantage of the beautiful weather and the gorgeous trees. And here's a photo of me and my pretty mama. I haven't had a chance to go through the pics and edit any of them, but i think we managed to get a few really good shots. They were so cute, smiling and kissing and being all adorable. Weekly Challenge #286: "Straight to It"
What's the challenge you ask? Let me get straight to it. This week's challenge is to ONLY use straight lines. You can use all straight line tangles like i have, or you could try using a curvy lined tangle, but with straight lines - for example, what would crescent moon look like if it was all straight? And if you're on the Zentangle Mosaic App, - i'm @iamthediva - come on by and follow me, and i'm using hashtags on the app for each of my weekly challenges. So if you're game - use the hashtag #DC286 (Diva Challenge #286) for your tile this week! You can also search in the app for people's contributions to the challenge by clicking on the hashtag from inside the app, or using the search function. I can hear your frustration...this tile was very challenging...can see the trees getting ready for autumn ...lovely picture of you n mum...enjoy your week! Great, those photo's for and with your mum. I like the challenge! I'm actually fond of straight line tangles, especially ones like Paradox where one can achieve the look of curved lines using only straight lines. I also saw the Book of Mormon. Fun. I just love this challenge. Altering tangles is my favorite thing to do. Can't wait to see what everyone comes up with. Your tile is still fun even though it isn't your usual style. Love the photo with your mom! You and your Mom are so cute together. What a wonderful picture. And I love your tile with all those straight lines. It turned out very dynamic. I like this challenge so much that I did 2 tiles. Then when I uploaded them I did the 2nd one first and the first one 2nd. 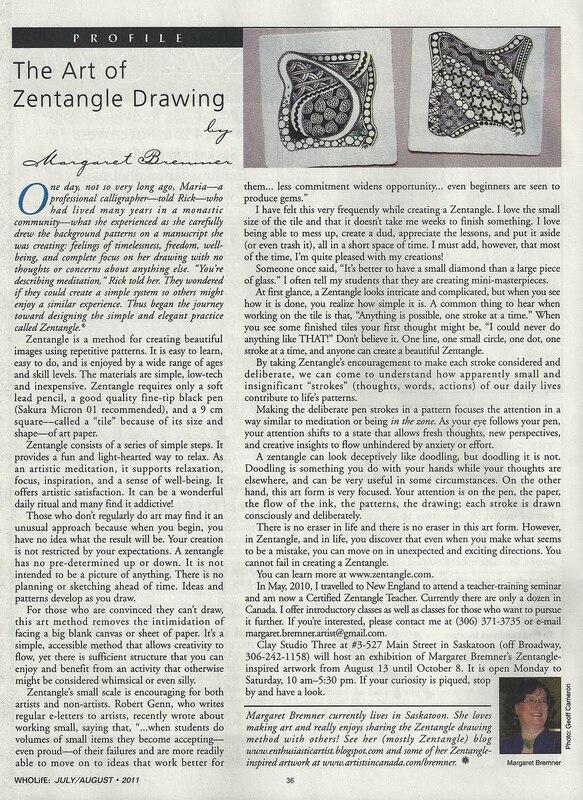 But no mistakes in Zentangle, eh? LOL Thanks for these wonderful challenges. Thanks for this challenge Laura, very kind of you to give this beautiful flowerpainting to your friend. Your mother looks very young on that picture! Enjoyed this challenge - thank you! Great challenge. Gave me a chance to use a few tangles I don't often put in my tiles! Love your flowers! I have tried everything that I can think of and I am not able to link up with Mister Linky. I did the tile and I am very frustrated that I can't link up. Please help! Many thanks for the Great Challenge! Whow, this challenge is so inspiring! Thank´s Laura, I will try it again for sure! Great challenge, Laura. 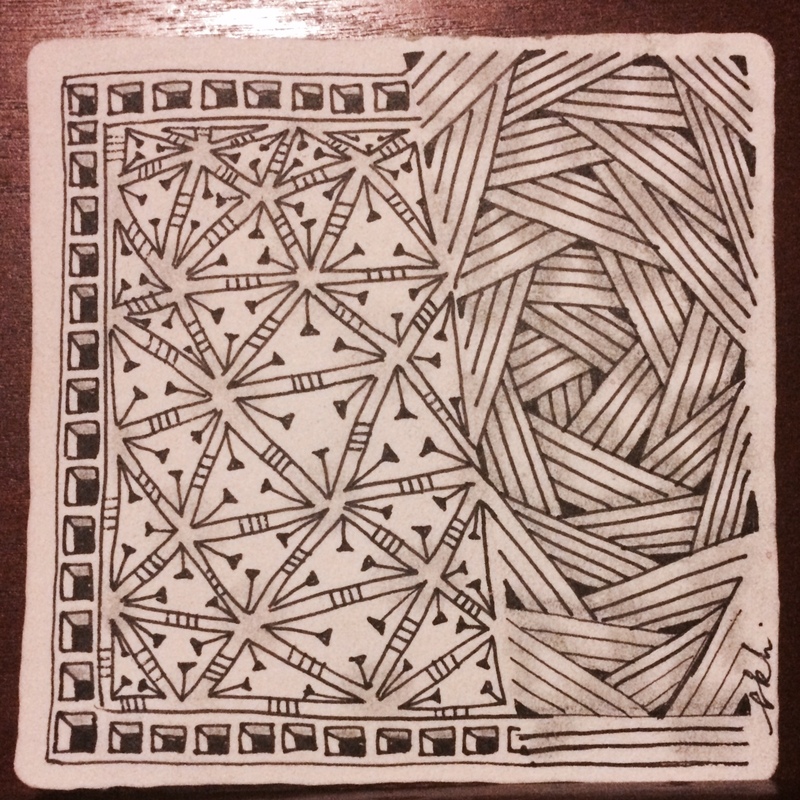 I took one of my tiles with all curved lines, and converted them to all straight lines. Fun idea. Love all your photos, as usual. 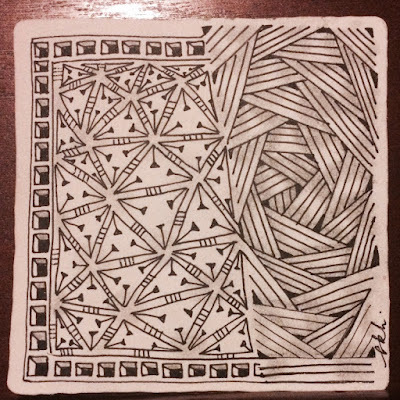 Had so much fun just using straight line tangles, which don't get out often in my tiles! Didn't think to alter the curvy ones, so I might just do another one! Thanks! I used three challenges for the price of one. I revisited an old challenge to use ing (not sure if it was yours or joey's sorry!) and had a much more successful attempt at last week's relax bro! while drawing my tile for this week. Thanks for another great challenge Laura! I had to do one more! This is so FUN! I might not hesitate to go on with this!!!! Thanks for this one! I've had an art block for a couple of months and Ifinally managed to do one I don't mind sharing! I love the challenges!